CNN is “freaking out” about the latest large iceberg. But John Sutter doesn’t mention that there was an iceberg twice its size in the year 2000 which was 11,000km2, and that as long ago as 1967, two other icebergs of a similar size were recorded. Thanks to John McLean for the links. Apparently the smaller of these two was called “Trolltunga” and floated around til 1978. (See the map far below). Sadly, the real Trolltunga was pre-youtube, no photos I can find, except of the region in question. This is the Trolltunga region. The little iceberg on the left is not “Trolltunga 1967″ which was around 45km x 100km. Wesche: B15 …. This giant iceberg—the largest observed from satellite (dimensions of 295 km × 37 km )—calved from the Ross Ice Shelf in March 2000. The B15 iceberg on youtube. B-15 iceberg, largest satellite recorded iceberg, photo. In Table 3 of Wesche, there are ten potential calving fronts greater than 200km wide spread over four sectors of Antarctica. It’s just a matter of time before another big berg breaks off. For the curious, Encycploedia Britannica has this map and path of Trolltunga, which bounced around near the Antarctic coast for years before heading into the Atlantic Ocean, where it still took a year to melt. Strangely Encyclopedia Britannica has no article any more. And in other unrelated but curious news, apparently Winston Churchill was considering using an iceberg as an aircraft carrier in WWII. Birkenmajer, K. (1980) The last stages of Trolltunga drift in the Weddell Sea, Antarctica *, Polish polar research, 1, 2-3, 235-237. Lazzara, M.A. ; Jezek, K.C. ; Scambos, T.A. ; MacAyeal, D.R. ; van der Veen, C.J. On the recent calving of icebergs from the Ross ice shelf. Polar Geogr 2008, 31, 15–26. Oh, and the sky is falling in again and again and again – ad infinitum! Surely the world’s largest iceberg is the north polar ice pack? Its floating all the time, gets bigger and smaller and is closer to Al Gore most of the time than anything down our way. All this talk of calving reminds me of a dad joke…. What do you call a cow after its given birth? How many apples grew on the tree…. Any storm in a tea cup will do when it comes to the global warming worriers. If none of these ice shelves had ever separated, the Antarctic would probably have reached Australia by now. Or you’d definitely be able to walk across from South America. The other thing that intrigues me is that if there were no calving of sea ice, how low would our oceans be by now, or how low could they conceivably go? Well . . 16,000 years ago global sea level was approx 400 feet lower than today. PS – if anyone has it, I’ve been looking for a map which would compare/overlay an image of the size of the Galapagos then vs now. “calving of sea ice”? Sea-ice doesn’t calve. Tidal glaciers calve – if they’re healthy, dying ones just recede back up the mountain, you can see that in Alaska. FWIW 1 – I think a female Dr Who is a dumb idea….it just further seems to prove the BBC has fully abandoned itself as a willing sacrifice on the altar of gender equality PC nonsense and what appears PC for the sake of PC. FWIW 2 – I have no issues with a real female doctor for medical stuff, but mess with Dr Who…nope….bridge too far. There are no more boyhood heroes remaining, or allowed to exist. But I wonder if this being the 13th Dr Who might be an omen? OT – I think the key here is “boy hood” – these days its all gender neutral stuff. Greek nouns have a state of “neuter” which means neither male nor female, and “neuter” is what the PC crowd seem to be aiming at. The other benefit of confusing society about gender is that some kids get confused about their sexuality makes them fair game to predators as well, which is bad. I mentioned Their ABC’s oddity article this morning to my wife and how the elephant in the room wasn’t touched upon whatsoever. Their ABC isn’t even trying to hide their bias anymore. Yes, what I fear is a Krystal Nacht against anyone who has any form of Conservative bias now…religious or non religious. They wouldnt do that unless they knew the general population were sufficiently brainwashed to support it. I’m not sure if this is common outside of the inner city coffee shops, but most of my encounters with people in rural Victoria (with the exception of Green tree-changers) indicate that not many believe much of what comes out of our MSM. It’s a bit like the US experience with CNN etc, they are rapidly being viewed as ‘fake news’ because all that they deliver is stuff that goes against the grain of normal people. When will they start calling her “Dr. Ho”? Just you wait, those past reports have not yet been homogenized. Anything to keep the great global warming scam, sorry gravy train rolling. Noticed on the last thread someone stated the obvious about ice eventually breaking off if counterlevered across the water but the resident troll wanted a link . I hope Julian has a brown paper bag handy for the ice-crisis and lack of CO2 from hyperventilating, oh and counter-leavers or the like involve physics so they’ll be of no interest to a warmist. Projecting horizontal beam fixed at one end only. Not to be confused with counter-weight. Thanks I blame haste and poor fact checking on my behalf, lets just call it lots of potential energy then. That was me that posted the original comment. Sorry David I know you didn’t use those exact words but I tried to do it justice , just thought how weird it was that gayeye or whatever the troll goes by wanted proof that ever extending sea ice would eventually break . Glaciers don’t calve unless they are advancing. Another global warming claim shot. In a discussion with people I (kinda) know, one theme kept coming back ’round – the idea that this and other ice shelves “hold back” the glaciers. If the ice shelf breaks, the glacier will eventually slide off its land-mass and – with, I suppose, a huge KER-PLOP sound, cause a huge sea level rise, massive tsunamis, and so on. My mentioning that some people were watching too many B and C grade disaster movies was not received well. Our Green Betters don’t believe one can transfer minerals to the ocean any other way than by hand-feeding. While they were hand-feeding iron in 2009 El Nino stirred up the silt in Central Australia and sent countless tonnes of iron to the Pacific on spring westerlies. The hand-feeders probably didn’t notice, being too intent on hand-feeding (in paltry amounts but damaging concentrations) from their expensive boat. Next time, leave it to the Red Centre or the Sahara, foosterers. The ocean will take some meltwater and the minerals in it, thanks very much. Part of the diet. Really, warmies, get a life. Yesterday, while hiking near Mt. Rainier at 2,000 m., I heard for the first time that those prone to seasickness often “feed the fish” when the roll is just right. Further those underwater, and holding a dive rope (?) can do the same, and so learn (if they continue the sport) to allow the rope to do its up-and-down thing but let it slide through a loose grip. Your use of the phrase “hand feeding” made me think that many sorts of minerals and chemicals can enter the water in unexpected ways. So…another heavily precedented unprecedented event. Looks like the climatariat will have to start burning old newspapers and encyclopedias. Not a very low-carb solution but someone strong will have to stop these unscientific practices of constant referencing, checking and verifying. As they used to warn students going off to uni back in the 60s, exposure to excessive knowledge can lead to loss of faith. In moderation again? Can’t imagine why? You didn’t use the “F” word did you ? No not that one the one that ends in “D” and has “RAU” before it . You know describes what all this globull warming is about . We’ve got you figured out Beth. Beth’s comment probably triggered the rationallity alarm. How can the trolls hope keep up, in the face of erudition and intellect? … and not once has one of the climate glitterati taken him to task on it. Perhaps they are also allergic to vowels? The 1956 Iceberg. Also mentions a biggie in 1927. There were two major glacier advances in Antarctica in 1850 and 1890, which accounts perfectly with sightings of large bergs by immigrant ships. Going further back, into the mid to late 18th century, the glaciers were expanding rapidly. So it stands to reason that icebergs have nothing at all to do with global warming, but are in fact a result of too much snow and ice influencing mass balance. UPDATE to the post: Tony Heller has found a newspaper story about an even bigger one from 1956. This monster iceberg was allegedly 334km x 96km or 32,000 km2. (h.t John of Cloverdale). Please someone check that maths. That is uuuuge. Icebergs are only a problem if you’re driving a ship named Titanic. Everyone else has learned to see and avoid. And larger is easier to see than smaller. Nah, Nah, Nah, Nah, MY iceberg is bigger than your iceberg! Icebergs happen! Why can’t CNN and the Twitterati just accept that. If I was CNN, I would pay more attention to the hooks that hold the sky up. Nobody is prepared to state how long ago they were last checked and serviced. They could break at any time, but nobody in authority is talking about that. I thought Chicken Little’s complaint would have fixed that by now. What happened? If I was CNN I’d admit that others do it better then close up the store and go home. 32000 km² is slightly larger than Belgium 30,528 km² or Massachusetts 27,363 km². Incidentally, the B15 Iceberg at a trillion tonnes is not that large. A trillion tonnes of water is a 1000 cubic kilometres. Lake Superior has 12 times the volume. If B15 were a chunk of ice flowing into the sea it would raise sea levels by around 2.75 mm. Makes one realize how big the oceans are. The last major calving was Larsen B in 2002, with an area of 3,250 km2. This inmplies the annual rate of implied movement is very small on a global scale.. There is estimated to be 26-30 million km³ or 24-27 thousand trillion tonnes of ice in Antarctica. So the odd trillion tonnes is very small. The Larsen C ice-shelf is located in the Antarctic Peninsula, which comprises 2% of the Antarctica and is climatically different. I have a useful map showing the relative size of the Iceberg to Antarctica here. The standard unit of measurement for large volumes is small countries or Olympic swimming pools . Well Belgium rates lower than a swimming pool, so…. In other words, the unit of measure is anything that does not enable a proper perspective relative to the real world. It is just like looking at renewables in terms of homes (not Gigawatts) or ocean warming in terms of four Hiroshima Bombs per second, rather than time taken to heat the oceans by 1C – which is hundreds of years. Since the truth hasn’t mattered a bit for so long why would it matter now? The whole ideas was to bamboozle people into following some of the worst and most dishonest pretenders to leadership and correct scientific procedure. Good point Roy. Why should the truth matter? For masses the truth would undermine costly and useless renewables policy. But more importantly, it would completely undermine people’s beliefs about the world, probably far more than the impact on communists of the fall of the Berlin Wall in 1989 or Khrushchev’s revelations of Stalin’s purges in the 1950s. The Greenblob BBC were stunningly and unusually, quite mute on the subject. I suspect the UN propaganda meisters are beginning to dimly perceive that peddling climatism and catastrophism at every turn might just be a trifle predictable, tiresome, desensitising and obvious. But over at CNN, Fake News Central, they peddle out the likes of Eric Rignot, a glaciologist at NASA’s Jet Propulsion Laboratory and the University of California, Irvine, happy to wander about wearing the usual end-times placard, ‘The End is Nigh’. He probably hasn’t too long left at NASA with the change in guard, so nothing to lose. Meanwhile the Antarctic continues its cooling trend of 0.14C/100 yrs for 37 yrs 7 mo, and I’m enjoying a good Merlot. If they are willing to lie/connive so ineptly but outrageously about climate, what else have they been willing to lie/connive about? This won’t just backfire on the climatariat. What the media found so easy to do to us is going to get harder and harder for them. Some years back a mate of mine was caught up in an investigation by 60 Minutes of a person he knew professionally. What he told me then about their fakery and manipulation was shocking, and I was thereafter even more wary of such programs. Over time I’ve come to suspect that it’s not just 60 Minutes and the more luvvie-friendly stuff like Four Corners, 7.30 etc. It’s just about all mainstream media, including the reportage and commentary that’s pitched to appeal to my conservative mind-set. So I’ve turned ‘em off and left ‘em off. They’re out of my life. I lost trust in the Melbourne Age right back in the mid-90s for a similar reason. I never bother with TV ‘news’ now and despise all programmes like the 7.30 report and ‘documentaries’. The latter, despite great photography, are not worth my time, with ghastly overbearing muzak, self-conscious ‘look at me’ overpaid presenters and always the obligatory curtsey towards CAGW/CC and the ‘we are all guilty’ meme. Yuk to the lot. G Barrier Reef this afternoon and almost froze my toes off, the sea water was so frigging freezing! So much for the warm sea water we were promised in these parts by the Warmest Ministry! Does that make Frydenburg Turnbull’s Minister for Warming? It could merge with the Ministry for Silly Walks and save some money. There are so many Climate Change Warming Renewable Clean Electricity agencies you cannot keep track of them all. Consolidate them all under the Ministry for Warming. What difference does it make if the ice breaks into one big piece or a larger number of smaller pieces? Why are warmists obsessed with the size of the ‘berg? The bigger the burg, the more it can remain a hazard to shipping, and water-skiing old age pensioners. Lots of little pieces of berg are good for making cocktails but little else. That’s easy , one piece breaking of is due to globull warming , breaking into many pieces is catastrophic globull warming . Mind you no bits breaking off is also a sign of globull warming . You’re right. It’s worse than we thought. From Chicken Little’s perspective, an acorn falling on her head is taken to mean the sky is falling. From a wider perspective, it is simply an Oak tree doing what Oak trees have been doing since the first Oak tree became and adult. There is much to be learned from the old tales and fables. It is sad that they are no longer a much used part of the effort to pass along human culture. Long ago, they were the way common sense was taught. Today? Hardly ever. Most of what we have today is 10 second sound bites or 145 character tweets without significant content. Don’t tell the Greens where the oak tree is. They’ll cut it down! They will call it a long lived repository of man made CO2. Then they will insist that it is to be protected from being converted into furniture or any other human use. All the while to be left exposed to naturally caused wild fires made worse by their prohibition of proper forest management. Even the partially burned trunk is to be left to nourish the next version of the once great forest rather than to be put to good use by man. This is but one of the countless ways they demonstrate their hatred for being human or anything associated with humans. Oh I dunno! They’ll say the oak is not a local species and that it attracts bats! And that it causes erosion and its seeds polute the nature reserves! It’s been classified as a “weed” don’t forget! What, are you an “oak tree lover” or something? It’s ironical, in my last comment I just repeated what I was told by the “head arborist” at a South East Queensland local council (Greens dominated of course) not so long ago when I was trying to save a beautiful old oak tree from their chain saws in a nearby public park reserve. After being told oaks were “weeds”, I was labeled an “oak tree lover”. This was meant to be a patronising label but I took it as a compliment because I love all trees unlike the Greens. The Greens used to be known as Tree Huggers but now they hug turbines. Oh here’s a good idea. In places where wind turbines have taken over the environment in competition with the poor trees that used to be there, we should try and get the turbines classified as weeds because they are not a local ‘neightive’ species ha. Then the leftie pc brigade will get confused and start cutting the turbines down. Ahh. There is your problem. You loved the beautiful old oak tree and received pleasure from it being there. Obviously it is “all your fault.” If you had wanted to have it cut down and use the wood to build furniture, it would have been protected. Since you wanted it preserved, it had to be cut down. Humans receiving value from the tree cannot be permitted. Heads they win, tails you loose. What about the 17,000 + sq klm iceberg observed by the crew of the SS Glacier in 1956. That is over 5 times bigger than this latest pipsqueak. Icebergs are up to 75 meters above the surface of the water. 90% is below the water so are up to 750metres thick. Sounds a lot except the the ocean there is 4km deep. The iceberg hardly matters in volume and they would be stopped by the continental shelf. When they melt, the water level will be unchanged. Melt they will. The great news is that now the world is much warmer thanks to the miracle of the industrial revolution and South Australia’s windmills which have done absolutely nothing to cool the planet, these icebergs will melt faster and be much less of a hazard. So that’s a good thing. Thanks Global Warming. By the way, thanks to the bouyancy as discovered by Archimedes, the weight of the iceberg out of the water is exactly equal to the difference in weight between the water displaced and the lower density ice. Or if you like, the increased volume is exactly out of the water. So when it melts, the volume reduces and icebergs or sea ice does not increase the water level. So what was the problem again? As only 2% of the world’s population lives south of Townsville, the tropic of Capricorn, it is utterly meaningless as an event, except for the sensationalist press. Besides, we still have Bruce Willis? I occasionally remind Greenies about Archimedes and suggest that Climate Science must be 2200+ years behing the times. They don’t thank me. Greenies will never have a Eureka moment. Except from not washing or reeking from stupidity. Reeking of stupidity!..to early, will have to leave soon and partake in another action Greenies will never know, work! The engineer Archimedes’ greatest gift was the incontrovertible demonstration (57BC), that Earth’s atmosphere exhibits no weight whatsoever! Way before mass was discovered. Icebergs are getting a bad name in the press now, and it’s a shame. and using it for a fresh water supply. If icebergs aren’t renewable, I don’t know what is. The prevailing wind over the thing might even counter a little bit of global warming. on that score. See the headlines: ICE MELTS!. And you could put an airstrip on it, then make the airstrip disappear….another green dream. Churchill was right, ya know (ice9, ice9). Yup, never mind reality, just another Hollywood story needing a good PR flak. Miranda Devine has made it to DrudgeReport. hit the big-time! 16 Jul: Daily Telegraph: Miranda Devine: Who’s afraid of the big bad climate monster? Fossil fuels are here to stay, despite Al Gore. a powerful message to the world, Miranda. The happy fact is you can only get really big icebergs when it is very cold.i If the ice ever melts away a lot the icebergs would be much smaller. Ie global warming can only be proved by little icebergs. Global Warming – None Like It Hot! What ever happened to that guy that set up a tent on an iceberg? He was planning to camp out on it to raise awareness of global warming and just go where ever the berg took him. I don’t recall seeing anything after the initial press release and fanfare. Mission is to be in winter 2018. He says he’s using solar panels but unless he has a battery pack to last six months or more during darkness and low light he’ll need a fossil fuel generator. He’s strangely silent about that. The south end of Greenland is at 60° N.
At winter Solstice that gets 5 ½ hours of daylight, and increasing once mid-January rolls around. Bellini hopes to be moving south, so that would help. But really, I don’t care. Being and old curmudgeon, I find such things worthless. Has nobody thought to tell him that icebergs tend to roll over, from time to time? He could be unceremoniously dumped into deep, cold, water. Ice-flows, one the other hand, just tip up so you can gracefully slide into the deep, cold, water. It is one way of determining which hemisphere you were in at the time. If icebergs tend to roll over, spare a thought for Congressman Hank Johnson. See .. this is what we have to deal with. There was a wild theory that this ice-shelf was forming a wedge against the glaciers further back. Surprisingly, the BBC debunked this theory, quoting a Prof Helen Fricker. Most glaciologists are not particularly alarmed by what’s going on at Larsen C, yet. It’s business as usual. But, unsurprisingly the Guardian tried to push this false alarmism, particularly in this comment. By placing the second paragraph (on the consequence of all Antarctica melting) right after one on an unsupported theory, it makes it seem to the unwary reader that ice shelves are acting like buttresses to all that ice. I’m since when did warmists believe in science, Gee? Scientists fight back against catastrophe theory. Q: is this the area of the Antarctic with undersea volcanoes? Just interested to know. No. This iceberg is part of the Antarctic Peninsula, the Volcanoes are under West Antarctica. This graphic from the Guardian shows the thin arm of the Antarctic Peninsula. The Antarctic Circle goes through the top end of Larsen C, so it is at the most Northerly extremity of the frozen continent. The Volcanoes are in West Antarctica, along will the vast glaciers which sit on top of the hidden volcanoes. The is the nobble at the left of the graphic, from which the arm of the Antarctic Peninsula extends. Most of the area of Antarctica is East Antarctica, the big round area to the right of the graphic. This map from geology(dot)com shows the Larsen ice shelf on the left, and the West Antarctica. Most of the West Antarctic peninsular is an ACTIVE volcanic region. Many times in the cold Waddell Sea. Isn’t it penguins that waddle down to the Weddell?! Victoria’s Dopey Dan wastes more taxpayer money. As Trump drains the swamp the swamp rats are looking for other feeding grounds. But what has it got to do with global warming anyway? Aerial photography shows deep cracking before separation that credibly aligns with a hinging effect as sea tides rise and fall. Surely, it must be a bending fatigue failure! Temperature change in the ice is trivial WRT the mechanical properties. There is an argument that the ice shelf is getting thinner and that thus its section modulus is reduced (reduced bending strength), but this would also seem to be trivial in relation to the currently great thickness of the ice (only about 10% visible freeboard I think). Maybe summer surface melting may accelerate the deepening of the crack, but the prime cause remains mechanical, including perhaps from wave action in storms creating heaving waves in the ice? For all the size of this iceberg, Antarctica is 2x the size of the continental US, the size of South America and as tall as the ocean is deep, 4km. An ocean above ground. This iceberg is a snowflake. This iceberg has broken off because Antarctic ice is growing, not shrinking. Only an alarmist would conclude the place is melting. The Global Warming scare just does not work in Antarctica, a place too cold for life below 60 latitude. At 69 degrees North, the Russian city of Murmansk has a population of 300,000. Our Antarctic Mawson Station at 67 degrees South houses up to 60 people in summer and a massive 20 people in winter. No Opera then? Al Gore’s scary tale is just so silly in the Southern Hemisphere, as was proven by Prof Turkey and his Ship of Fools. However with 2% of the world’s population in the South including Mawson base, we in the South have a huge Ozone hole and we pay $200 a litre for refrigerant, largely punitive government taxes. Again Australians saving the world by paying massive taxes, this one so high it is cheaper to buy a new Chinese airconditioner than to regas the old one, but isn’t that the idea? Send all the money overseas. People complain about Trump’s make America Great. No one notices the UN agenda of Make China Rich. 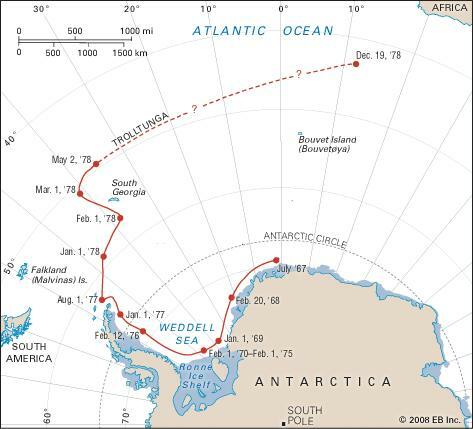 A little off topic, but very interesting is that the Weddell Sea is where Shackleton’s 1914 Antarctic expedition on the Endurance became stuck in the ice. The ship was eventually crushed and sank, leaving the crew to survive on the ice. They salvaged two life boats and used them to eventually escape the ice to Elephant Island. Shackleton and a small crew set off from there to South Georgia Island, where he was able to reach the whaling station and effect a rescue of every one of his men. Frank Hurley produced a amazing photographic record. It was an astonishing feat of survival and heroism. If anyone can find a copy of the book “Endurance”, get it and read it (it may be on Amazon kindle). If you are in Sydney you can see Climate Hustle tonight (July 18, 2017). It is free but you have to book. We all know the climate change gang of scam artists not only ignore the historical facts but often twist them to fit their agenda to promote their scam. That’s how they highlight what we observe happening today and make it appear like it’s all out of control due to human induced CO2 emissions. Yet the facts speak for themselves and I wonder why they are not all taken to court for scaremongering and exaggeration that would land anyone in prison if they did something similar in other areas. The media and the warmistas are oppressing the right of the icebergs to break free from mainstream stereotypes. and what are the scientists saying about this? Forget about the “science” they haven’t used it in years just Crystal ball and computer games along with scary and wild predictions of which none have come true . And who cares what a scientist says about an icebergs right to break free from mainstream stereotypes anyway . what a completely useless comment. So you are happy to rail against the msm but when the scientists agree with you (ie they say this berg is unexceptional) you ignore them because of your own view of science. So how many MSM reports have you seen where the reporter has pushed some so called expert , with one sided loaded questions about the iceberg and globull warming ?Everyone I’ve seen in this country OZ anyway , icebergs breaking away or calving is a natural phenomenon and has been happening since the earth has developed ice . Now if you ask for a link for that last statement it will show just exactly what sort of a troll you really are . seen plenty of such reports and I agree. This has nothing to do with the fact that the scientists you characterise with silly and undefined terms like crystal ball and computer games actually agree with you on the reasons for the crack in the ice sheet turning into a berg. From my general reading the scientists agree that this particular berg is recalcitrant and doesn’t fit their preferred meme. It is what it is. Gee Aye you need to seriously lift your game. If you understand me correctly I’m saying the MSM are trying to get anyone to blame this event on globull warming . As for Crystal ball gazing and computer games and wild predictions of so called scientists , can you give me one just one example where scientists have empirical evidence to prove their claim on ocean acidity due to increased Co2 or the affect of Co2 causing a runaway warming climate . Only those examples that haven’t been debunked or exposed as garbage by other scientists allowed no cheating . I wonder what the warmists think the alternative to iceberg carving is? Do they think there should never be any carving and the ice shelf expands indefinitely? Are you talking about the general public with no scientific background or polar scientists? I’ve not heard any relevant experts claim anything other than this is normal. I’m still waiting for a link to any scientist with expertise in this field who says this is not normal? Not getting much of a response from the little troll with the fake name . this is a straw man. Maybe you can show me a scientific paper where runaway warming climate is predicted or where CO2 causes an acidic ocean. If on the other hand you are talking about a lower pH and plain old warming, that is a bit easy. Of course before I went ahead and did this fool’s errand, it would be good to know what you define as empirical evidence. I ask because there are a lot of lay definitions that differ from each other considerably and I don’t want to waste my time by assuming one thing only for you to claim that it is not empirical. Heaven forbid, develop cognitive dissonance and you’ll always have the last word. Twinotter is a better resident troll than you. Maybe you can show me a scientific paper where runaway warming climate is predicted or where CO2 causes an acidic ocean. Oh Ye hypocrite, what is the definition of straw man . We both are guilty of this to a degree but the argument that empirical evidence for Co2 induced CAGW just do not exist . Each side of this argument is tested by the other , our side have never withheld any research or work to prove your side wrong , we never adjusted then readjusted our work to suit our view . Asking anyone to prove otherwise puts you into the straw man category , you either have proof or none and in this case you have didly squat . Look up the meaning of the word “Empirical ” and see if it fits your meme . As per the off topic questions raised, do note they were raised with a ‘demand’ that I address them. Another common Troll Tactic. Raise a point NOT relevant, likely not even appropriate, then “claim victory” with a vague odour of “the folks demanded at must be incapable”. It’s a subtile variation on “Have you stopped beating your spouse?!”. Never ever answer, either yes or no. At most, point out the question is absurd and ask why would one ever ask it. But add another Troll Count point. Professor Nancy Bertler, of the Antarctic Research Centre at Victoria University of Wellington, says this iceberg discharge is directly linked to ozone depletion and industrial CO2. I haven’t seen a paper but she must have written a few, after all she has been wandering around preaching imminent SLR and the catastrophic consequences to follow. In regards to your troll status …. The rafting of large bergs is related to the intensification of the Subtropical Ridge and its southerly latitude, which is happening as we speak. Its a signal. Queensland firefighters attended at least 64 fires caused by solar panels since the start of 2015, amid industry warnings that the risk of more severe fire is growing as consumers rush to adopt lithium-ion battery technology. A spokeswoman for Queensland Fire and Emergency Services said the service had attended 15 fires caused by solar energy systems in 2015, which more than doubled to 33 incidents last year. That’s a very interesting point. If the battery stores say a charge enough to power a Tesla for 300km, it is equivalent to a tank of petrol, with the same explosive power. If not an explosion, then a fire which would be devastating for the average home. One of the advantages of a central coal power station which supplies power on demand is that there is no domestic storage, no domestic storage risk. The move to add mandatory domestic storage is equivalent to a big LP gas bottle inside every home. It is therefore a foregone conclusion that deaths from fire will result. They will be the result of ‘Green’ policies. They may even be frequent. Big fires too which can sweep through crowded areas or high rise or terrace buildings. You have to wonder at the nett value to society of eliminating this carbon dioxide ‘pollution’. So stop breathing, as every living thing on this planet is a carbon dixodie polluter and there are 5 billion more people on the planet than 100 years ago. I suspect these fires would not be ones you could put out. The collapse of the batteries would generate enormous heat even without oxygen. This would be closer to say 300kg of magnesium, which can burn without oxygen. Consider..”A thermal runaway means that the battery cell releases stored energy rapidly, and lithium-ion batteries with higher energy density can release a lot more energy more quickly than other battery types. Lithium-ion batteries contain a highly flammable electrolyte, so they store both electrical energy from the normal battery chemistry and chemical energy from the lithium-based electrolyte. So you can forget your fire extinguisher. Run. TdeF, you indirectly raise another issue. Traditional insurance policies place limits on the amount of fuels you can store at home e.g. petrol/(US)gasoline and LPG/(US)propane without having special facilities. The whole battery storage and solar panel thing is going into unexplored territory for insurance companies especially since firefighters are reluctant to gain roof access by cutting through solar panels that might be energised at hundreds of volts or deal with battery fires. The other insurance issue is the high value of a solar panel and battery setup which could be tens of thousands of dollars extra that needs to be insured, apart from the extra insurance risk such installations incur. “We are aware of as many as eight recalls nationally over the last five years of DC isolator switches which are located next to the solar panel on the roof,” (Energy Safe Victoria director Neil) Fraser said. But CEC chief executive Kane Thornton said yesterday the lithium ion batteries were ***not a fire hazard, although he acknowledged it would take time to fully understand their risk. A spokesman for Victorian Energy Minister Lily D’Ambrosio said the industry was heavily regulated and the fire risk from solar panels was not high. ***not a fire hazard OR low risk? The technology is plagued with challenges, and renewable energy advocates are starting to realize that the true cost of solar must include the environmental impact of manufacturing, maintaining and disposing of solar panels and batteries. Both contain hazardous chemicals and rare materials that have an impact on the environment all their own. “Companies planning to use more renewable energy are doing so for the financial benefits, while businesses with no intention to use renewables say it’s because it’s too expensive,” says the report, provided to Fairfax Media ahead of its release on Tuesday at the Australian Clean Energy Summit. But when you push further you find out that of the 46 companies which actually use renewables only three (yes, 3) use it to supply in excess of 10% of their energy needs. And of those that are looking into renewables are allocating between $1 and $100 million … might sound like a lot, but when you are talking the top 96 companies in Oz that is a drop in the virtue signalling bucket. These are sophisticated companies. If they could save oodles in costs by switching to renewables you wouldn’t be able to stop them. The fact that they only get a smidge of their power this way is all the information you need to know. Renewables have been weighed, measured and found wanting. Almost beyond belief, but it is the Age. The last 1000 years of temperature and CO2 levels show no correlation. The last 10,000 years of temperature and CO2 levels show no correlation. The last 1 million years of temperature and CO2 levels show no correlation. Why does anyone think that this time it must be different. Historical record alone say the CO2 levels and global temperature are NOT correlated. The covariation of carbon dioxide (CO2) concentration and temperature in Antarctic ice-core records suggests a close link between CO2 and climate during the Pleistocene ice ages. The role and relative importance of CO2 in producing these climate changes remains unclear, however, in part because the ice-core deuterium record reflects local rather than global temperature. Here we construct a record of global surface temperature from 80 proxy records and show that temperature is correlated with and generally lags CO2 during the last (that is, the most recent) deglaciation. Differences between the respective temperature changes of the Northern Hemisphere and Southern Hemisphere parallel variations in the strength of the Atlantic meridional overturning circulation recorded in marine sediments. These observations, together with transient global climate model simulations, support the conclusion that an antiphased hemispheric temperature response to ocean circulation changes superimposed on globally in-phase warming driven by increasing CO2 concentrations is an explanation for much of the temperature change at the end of the most recent ice age. These observations, together with transient global climate model simulations, support the conclusion . . . Adjusted observations are not in fact observations . . and thus, are dubious at best. Non-validated climate models support nothing. And don’t forget this bit of ground breaking proof . The role and relative importance of CO2 in producing these climate changes remains unclear . Or there’s this gem . The covariation of carbon dioxide (CO2) concentration and temperature in Antarctic ice-core records suggests a close link between CO2 and climate during the Pleistocene ice ages. My cat had wings and feathers in its mouth the other day , so I suggest the cat was growing feathers and therefore this supports the agreed conclusion that my cat has turned into a chicken . Or, more fully . . These observations, together with transient global climate model simulations, support the conclusion that an antiphased hemispheric temperature response to ocean circulation changes superimposed on globally in-phase warming driven by increasing CO2 concentrations is an explanation for much of the temperature change at the end of the most recent ice age. We have zero T observations “at the end of the most recent ice age”. We have zero CO2 concentration observations “at the end of the most recent ice age”. But, but, but . . we have proxies, though. That should be fine, right? Good thinking 99 . . let’s feed that into our non-validated climate models, write a paper and send out a media release. See . . this is why we can’t have nice things . . not even electricity. Any reference for that quote Gee Aye? well I didn’t make it up but it might prompt you and others to look yourselves and to be sceptical of absolutist claims like “no correlation” and “no evidence” etc. I found many papers that don’t agree with tomos claim. He and you might well disagree with the published science on CO2 but it you can’t claim that there is nothing out there. . . but it you can’t claim that there is nothing out there. Any peer reviewed X-Files science on that one? I think we’re getting closer . . But more seriously, people can literally claim anything they like. It’s pretty much guaranteed when we consider any non-testable hypotheses. tomo asked for correlation not causation. Concoctions from AGW advocates are not evidence. So you are saying that if a scientist finds a correlation it is automatically rejected by you because they found a correlation? No I was never asking a question! Indeed it was a rhetorical question, as it is a correct statement — PERIOD! Those that attempt otherwise this time do little but prostituting themselves and their profession for some transitory fame and fortune. They only cuckold the honorable profession of science with their modeled nonsense, that is not science, it is sophistry mixed with outlandish deranged imagination — its little better than a Hollywood sci-fi production. Real science tests its hypotheses against the observations, against the measurements. Thus far there has never been correlation on this planet between CO2 level change and temperature change, therefore to say otherwise demands extraordinary evidence. Mudelsee (2001) – Over the full 420,000 year Vostok history Co2 variations lag temperature by 1,300 years ± 1000. Also of note is the relationship between CO2 and temperatures in the ice core data. Each time after an ice-age CO2 continues to rise for a significant period of time after temperatures begin to fall. This adds to the evidence of CO2 not being a major driver of temperature. CO2 starts to fall long after temperatures plummet, it being dragged down by the falling temperature. If CO2 was a major driver of temperature, then the CO2 would have stopped the temperature fall, or at least slowed it, however CO2 continues to increase as temperatures begin the decline. That also drive a nail to the heart of the premise of CO2 being a main driver of temperature, no matter what modelers with degrees in scientifical sophistry says. Congratulations, you’ve figured out what the feedback is when you cause global warming: more CO2. That is Antarctic ice cores against global air temperatures which may indeed have lagged CO2 in ice cores. Does that mean CO2 causes warming? No. The question is how is global temperature measured? Assuming the proxies are accurate, are they land based? Simple physical chemistry tells us that CO2 is controlled by ocean temperatures. So oceans get warmer, CO2 goes up (most CO2 is in the ocean), the world gets warmer but not because CO2 went up. We have exactly the same situation today. Air temperatures are static, at least for the last 20 years. Ocean temperatures are rising and CO2 levels are rising, as Henry’s law says they must. Air temperatures may in fact go up later at the oceans cover 75% of the planet. That does not mean CO2 causes warming. However the paper seems to suggest that because CO2 levels measured in Antarctica seem to lag temperatures, that CO2 causes warming. That is not true. That is a correlation equals causation argument, which is surprising but very acceptable to Nature. In 2011 it was all the rage. Will we see headlines on the effect this “could/might/etc” have on Arctic ice? Cape Canaveral Fire Rescue Assistant Chief Chris Quinn said arriving firefighters found active fire in the roof decking when they arrived. Chief Quinn said the SpaceX building did not appear to have hazardous materials in it. The Sunday afternoon roof fire at a SpaceX building at Port Canaveral has been ruled an accident, a Cape Canaveral Fire Department spokesman said. The state fire marshal was at the Magellan Road site until about 9 p.m. Sunday, said Assistant Fire Chief Chris Quinn. A crew was using a grinder on the side of the building Thursday or Friday. A hot ember sparked from that work landed on a piece of wood, and eventually ignited. It was accidental, he said. Quinn said the fire was relatively minor, but it was difficult to access. “It’s a very large building,” he said, rising a little more than two stories. One Cape Canaveral firefighter was transferred to Cape Canaveral Hospital, where he was treated for heat exhaustion, Quinn said. Tim Thuering, captain of the Highland County North Joint Fire and Ambulance District in Leesburg, said he was driving by Leesburg American Legion Post 568 when he saw what appeared to be flames coming out of the side of the building. When he inspected the flames closer though, they were coming from a solar panel that powers a light above a mural of different scenes from Leesburg that hangs on the side of the building. another good idea with unintended consequences! The blaze broke out at the Coolaroo SKM Recycling factory on Thursday morning after firefighters extinguished a smaller blaze at the site on Wednesday night. Emergency services issued an evacuation warning for the suburb of Dallas at 8.30pm on Thursday night, with very poor air quality levels detected by the Environment Protection Authority. “We’re saying it could go up to three days to put the fire out completely,” MFB deputy chief officer Ken Brown told 3AW. “It’s a mixture of cardboard, paper and plastic and they’re ground up into fine pieces of stockpile ready for the recycling process,” he said. “They burn rapidly, they burn deep-seated and they’re very hard to extinguish.” Clarissa Garrow, who works directly across the road from the fire, said the blaze was “insane”. COMMENT: by Chris: More filth in the atmosphere in a few days than a year from a coal fired plant producing months of electricity to South Australian homes..For those that need it. Of course this is just “pollution” and has nothing to do with carbon emissions. OT another Green gone maybe ? Larrisa Waters ? Just resigned from the senate . Same reason as last green poly resigning , dual citizen . I am wondering how many more pollies are going to get caught up in this one. It is a silly law TBH, but them’s the breaks. the fact that she needed legal advice says a lot about it. I know several people who are still unsure about their status and one is currently going through the motions to get a British passport in part to be certain about this (I wont go into why this is important but it is not politics in this case). Basically he was born after 1983 in the UK (rules different prior to 83) and his parents were not British citizens but were employed in UK with right to reside visas but were not permanent residents. Right to reside seems to mean he can claim to be a British national but aspects of the wording of the regulations suggest he may not. Why would you need legal advice to know whether or not you were born overseas ? Nothing to do with being born overseas which would make you a dual citizen no matter what age you came to Australia hey . When an aspiring chriiminal wants to become a politician they sign a legal document which under the relevant section you are not entitled to become a parliamentary rep if you hold dual citizenship . Unless of course you’ve renounced the other country and this is very clear to them as witnessed from their own mouths . Their excuse is I assumed , or didn’t bother to check because I thought, etc etc . You’re not a very good troll are you ? And you’ve just let everyone know who pays your wage for trolling . Your ABC is on your side by the way and also share your sentiments on this matter but rules is rules , break them and suffer the consequences. One green goes it’s a tragedy two go and it’s a bloody good start . What are you on about? Or on? I think he’s on about proving he has NFI, Gee. Being born overseas has no automatic implication about citizenship, and nor does being born in Australia. I have a daughter who was born overseas and she has single Australian citizenship, whereas I was born in Sydney with dual citizenship. I don’t think Robert has ever been wrong about anything. He is not about to start now. Passage required two-thirds of the legislators in each house. Twenty-eight senators voted in favor — one more than needed. Surviving the assembly required 54 votes in favor, and the bill secured 55. Several assembly Republicans crossed party lines to support it, even though some noted that California represents just 1 percent of the world’s greenhouse gas emissions. OT again but I was listening to the local weather report for my area of Victoriastan and it was light intermittent rain no more than 5mm possible . We just had a five minute downpour that has come close to flooding us out , from experience it’s about 15+ mm . Record cold temperatures in SE Australia. Quick, destroy more coal power plants. Not if our BOM has there way it won’t be the coldest . The study, compiled by the University of Tasmania (UTAS), said that an area of the Tasman Sea was affected by a heatwave for 251 consecutive days in the summer of 2015/16. The area, roughly seven times the size of Tasmania, experienced a peak intensity of 2.9 degrees Celsius warmer than expected, causing widespread harm for marine life. “Scientists are inherently conservative about making grand claims, but we can say with 99 percent confidence that anthropogenic climate change made this marine heatwave several times more likely, and there’s an increasing probability of such extreme events in the future,” Eric Oliver, the lead researcher, said in a statement. Is there a “metric” for the amount of combustible detritus allowed to accumulate on the forest floor due to the Green Nazista forest “management” policies (“don’t touch or come near”), which forms the perfect voluminous accelerant for massive forest fires, intentionally blamed on anthropogenic driven “climate change” and all past of the Grand Green Master Plan? Below are some of the key user-friendly (non-technical) points from Dr. Reinhart’s paper entitled Infrared absorption of atmospheric carbon dioxide (LINK). 17 Jul: Deutsche Welle: Cristina Krippahl: Will climate change turn the Sahel green? Climate change can be a good thing. At least for the arid Sahel region in Africa, where rainfall has been increasing as the world warms up. ***But to avoid dire negative consequences, precautions must be taken now. That is one conclusion reached by a research paper just published by the Potsdam Institute for Climate research (Potsdam-Institut für Klimafolgenforschung). “What is new is the observation that there are some scenarios where you get not just a little more rain, but substantially more rain, and it may happen quite suddenly,” Jacob Schewe, co-author of the new study, told DW. 17 Jul: LA Times: How did your lawmaker vote on California’s climate change program? Potsdam: On Wednesday, Brandenburg’s Economics Minister Albrecht Gerber (SPD) will present a draft of the revised energy strategy of the country to the economic policy speakers of all political groups in the Brandenburg Landtag. According to this, Gerber would significantly reduce the planned saving of carbon dioxide (CO) in Brandenburg for 2030 compared to 1990. (***The local government in Potsdam wants to lower the region’s carbon dioxide emissions by just 55 percent to 62 percent relative to 1990, compared with the current reduction target of 72 percent). Alliance 90 / Greens in Brandenburg, the WWF environmental organization and the environmental group Cottbus criticized such plans as a “devastating signal”, “revelation” and “trump climate insanity”. The environmental group Cottbus even sees the red-red coalition agreement in danger. ***found the bit in brackets on a website and it made more sense than the google translation, so inserted it. 17 Jul: National Review: Robert Bryce: Climate Lawsuit Brewing? Mark Jacobson, the Stanford professor who claims the U.S. can run solely on renewables, tells his critics he’s hired an attorney. no wonder I don’t watch ABC. why did Canavan even agree to go on this program? CAIRNS anti-coal campaigner Michael Dillon interrupted last night’s episode of Q&A to deliver a brief anti-Adani message to Senator Matt Canavan before being dragged off stage. Sen Canavan was being questioned about how Australia could profess to be bringing down carbon emissions while exporting huge amounts of coal when Mr Dillon took to the stage, waving a piece of paper. “With all due respect Senator Canavan, you are robbing us of our future and you’re taking away a safe economy for Queensland,” the 20-year-old said before being removed. Sen Canavan appeared to have already met the intruder, responding with a “thanks, Michael”. In a statement released by Stop Adani Sydney, Mr Dillon said he was born and raised in Cairns and all of his family was in North Queensland. Another spontaneous anti Carmichael Mine demonstration. Just looked at BOM’s weather report for my area and they have removed the predicted rainfall of 5 mm for today . Checked a competitor and they still have 5mm for today , I estimate we have had close to 25 mm so far today and it’s still raining outside and heavy at times . Correction , competitor says 5-10mm possible . I have never understood what you’re talking about. I still don’t. Maybe you should not resort to cryptic riddles about Britannica. There is no need to worry, Roy. Craig doesn’t know what he is talking about either. I was down there bobbing around the Southern Ocean in the mid 90s on a research ship and we saw a big one 26 miles long floating between 55S and 60S in the Heard Island area. Might have been carved of the Amery Ice Shelf was pretty impressive to see. Had big swells crashing into it and the spray was way higher than the ice cliffs which must have been 30m high I guess.